Built smack in the middle of some of the most gorgeous, pristine scenery in America; warmed by crackling fireplaces and full of rustic charm, there’s something special about spending Christmas at a grand National Park lodge. Besieged by tourists in the summer, they’re calmer, quieter and decked out for the season in the wintertime. The weather outside may be frightful, but these historic lodges – with log-beamed ceilings, grand lobbies and scrumptious holiday feasts – promise warm Christmas memories. Carolers may sing about walking in a winter wonderland, but visitors who come to Yellowstone when it is covered in snow get to experience the real thing. The Old Faithful Snow Lodge is one of two inns catering to guests who want to stay inside Yellowstone when the weather gets cold, and its 100 rooms and 30 cabins usually fill to capacity during the week between Christmas and New Year’s, said Rick Hoeninghausen, a spokesman for Xanterra, which runs the park’s accommodations. The lodge is in a festive mood for the holidays, with a big Christmas tree and live music in the evening for guests who want to sing Christmas standards. A special dinner will be served to mark the big day. But the main attraction, as always, are the park’s geysers, steam vents and hot springs, made more dramatic by the freezing temperatures. “In a geyser basin, it just becomes otherworldly because of the play of the steam and the cold,” Hoeninghausen said. Many guests also enjoy the scenery at night, fascinated by the starry sky that can only be visible away from city lights. “People think we have more stars here because you see them more. If you let your eyes adjust, you can actually see star shadows – the shadow on the white snow just from star light,” Hoeninghausen said. Wondering how to ring in Jan. 1 in Yellowstone? Visitors mark the occasion by watching the first eruption of Old Faithful in the New Year. 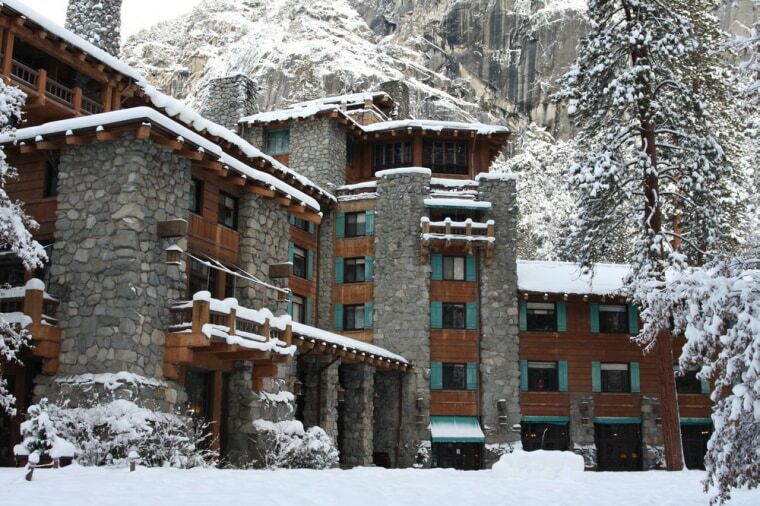 With spectacular views of Half Dome, Yosemite Falls and Glacier Point at Yosemite National Park, this grand lodge fills up quickly during the summer, but also lures visitors with its cozy atmosphere in the winter. The heart of the hotel is the Great Lounge with its 24-foot-high ceilings and a massive stone fireplace. This is where guests tend to congregate, drinking hot cocoa, playing games and feeling as though they were in their own living room, Cesaro said. First held in 1927 when the hotel opened, the event was meant to encourage people to come visit Yosemite in the winter, Cesaro said. Today, it’s so popular that there are eight Bracebridge Dinner performances. Guests are served a seven-course meal in the elegant Ahwahnee Dining Room during the production. Don’t want to splurge on the dinner, which starts at $299 for adults? The Ahwahnee hosts concerts in the Great Lounge throughout the season, which are complimentary and open to the public. For New Year’s, guests can dress up for the “Black and White Ball” dinner dance celebration. A Grand Canyon vacation usually guarantees two things: hordes of tourists and sweltering heat. Visit the park during the holidays, however, and it’s a whole different experience. “It’s a quiet getaway – the park is not crowded. Often it has snow and that adds to the romance,” said Bruce Brossman, a spokesman for Xanterra, which runs the park’s accommodations. With a prime location on the Canyon rim, the El Tovar Hotel is even more stunning for the holidays, with a 15-foot Christmas tree in the main lobby and poinsettias adding a bright touch to the wood décor. It’s been snowing steadily at the Grand Canyon, so visitors will experience a white Christmas, a time of year that’s so popular at the lodge that the hotel usually sells out, Brossman said, adding that shouldn't stop people from dropping by. “You don’t have to sleep at El Tovar to enjoy El Tovar. We can’t accommodate all the people who actually want to stay there, but the lobby and the lounge and the dining room and the porches are all public spaces,” he said. The hotel hosts special dinners on Christmas and New Year’s, though there are no official parties scheduled. "It’s just a very peaceful, quiet place to spend the holidays," Brossman said. "And, of course, when it does snow, walking along the rim is just spectacular."